After 850 kilometres astride the CBR 600 I have found just how truly versatile the F4 is. 800 of those kilometres included some pretty hard riding over 2 days, without my body getting too sore from the experience. The CBR is a very comfortable mount indeed. 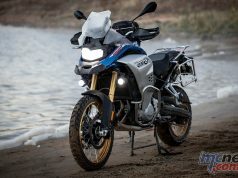 The suspension is a great balance for the road, hard enough to cope with some very spirited riding but soft enough not to give your kidneys too much of a hammering. The suspension does show its limits when being stuffed into a corner VERY hard. The pegs scrape and the whole show gets a little bit of a shimmy up, but it always remains composed and manageable. 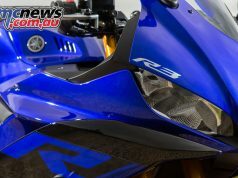 The GSX-R 600 would out corner the CBR. However, the GSX-R is a more narrow, focussed piece of kit that will give you quite a lot of headshake and generally requires a strong and experienced hand to get the best out of it. The CBR has a balance for the road that is about as good as it gets. 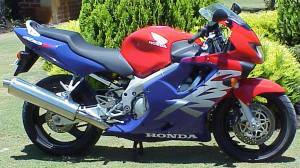 An inexperienced or relaxed rider would go quicker on the CBR. An all out nutter would go faster on the GSX-R. The CBR does have better brakes and a tiny bit more power than the GSX-R. The brakes are powerful but do not provide a huge amount of feedback. I put the CBR on the dyno but some tyre slip rendered our results too inaccurate to publish here I can tell you, however, that the CBR has around a 4 hp edge on the GSX-R between 8 and 10,000 rpm, the GSX-R then closes the gap to around 2 horsepower in the upper reaches. The CBR is the pick of the two if you like pulling the occasional mono as its very good carburation (superior to that of the GSX-R) allows wheelie height to be controlled quite nicely on the throttle. The gearbox is great, quite possibly the best I have ever used. A great gearbox can make the difference between an okay ride, or a really good ride. The CBR box was close to faultless. You have to ensure you are positive with your 5th to 6th shift but that is inconsequential when considering the overall brilliance of the box. The clutch is also good. But I did find fast getaways hard to accomplish. I have no doubt the GSX-R will win the straight-line drags . 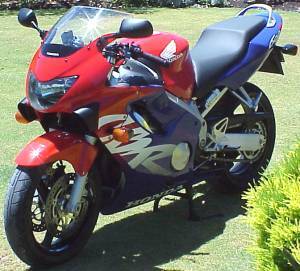 The CBR 600 would make for a great step up for the recent 250 graduate who likes a bike which is a bit on the sporting side. The nicely balanced chassis makes for foolproof cornering and the stability is good enough to keep you out of trouble. The most I managed to get out of the CBR was a little head wiggle rather than shake. If GSX-R mounted I would have been having quite a few bar banging moments along the same roads. The centre stand is a god send and easy to use. I am accustomed to being spoiled by my own bike which is fitted with a ScottOiler, but at least the stand on the CBR made lubing the chain a reasonably fuss free undertaking. The dash gives you two tripmeters, a speedo, tacho, temp gauge and odometer. Why it wasn’t fitted with a clock is beyond me. Surely the wiring to allow the digital tripmeters to include a clock would have cost all of 50 cents. The mirrors are vibration free and very good. So is the switchgear. The brake lever is adjustable. The clutch lever is not. Unfortunately I did not go for any night rides so I can not comment on the quality of the headlight beam. The nicely finished 18 litre tank gives you a range of well over 200 kilometres even when giving it some curry. The whole bike is very nicely finished. 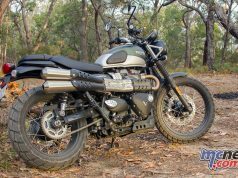 A high-rise pipe and removal of the rear footpegs would clean up the back of the bike and make it really stand out from the crowd. All in all the CBR 600 is a great bike that would satisfy all but the most serious of scratchers and power fiends. On a tight road however I don’t think more power would really help you get away from the little CBR.